“I don’t want a lawyer to tell me what I cannot do; I hire him to tell me how to do what I want to do.” J.P. Morgan, Sr.
As you may know, Morgan suffered from difficult health problems in childhood–seizures from which he came close to dying–yet lived to be 76 years old before it was over with. Having a critical YOD pattern between Moon and Saturn, the contact of which tends to indicate health problems in the end, if not before–and pointing to Pluto (not discovered until 1930, but their midpoint picture here is instructive all the same) shows a determination to succeed and a need to rely on oneself only, coupled with feelings of isolation. Moon/Saturn = Pluto: illness; depression; needs repressed; the threat of loss. Moon/Saturn contacts also show that with the determination the combo’s lack of nurturing in childhood gives, the native is driven toward prominence and fame. As America’s primo financier of his day, I’d say JP fulfilled his wishes on that score. 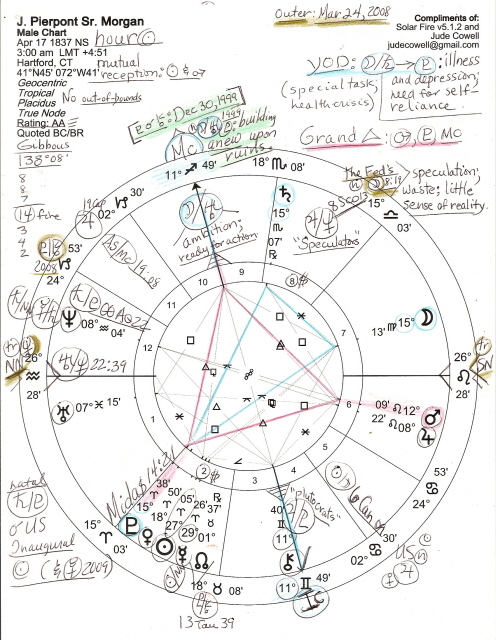 He’s even known for bailing out the US economy…and you’ll notice, if you click the chart to enlarge, that Pluto (guardian of the richest treasures) is conjunct asteroid, Midas, the gold-loving king, aka the hoarder. Moon/Uranus = Mc: much excitement about ambition; ready for action; potential gains. And often, Moon/Uranus together give an interest in the occult, Astrology in particular, and it’s well-known that Morgan was a prominent client of the great astrologer, Evangeline Adams, a descendant of President Adams. She also numbered among her clients popular singer Enrico Caruso and the Prince of Wales. What good might that do the US? you may ask. Wish I could think that any of these financial mystery plays are designed to do the common good any lasting benefit, but I can’t…undermining America in all ways is steamrolling right along, and it would be too much to ask of an old Robber Baron like JP Morgan to care when obviously his spawn don’t. Moon/Uranus = Pluto: the fanatical push for fulfillment of needs; bombast; stubbornness; self-willedness; a craving for sensation; building anew upon ruins. UPDATE Oct 6, 2008: After the worldwide ‘credit crunch’ and Bush’s Bailout Bill signing of last week, old J.P. is appearing in the news again – this time as focus of Daniel Gross’ article, The New Fixers, in which we discover details about Morgan’s rescue of the US financial system, Oct 23, 1907. “This is the place to stop this trouble!” exclaimed the premiere American Financier of the day giving America in her Panic of 1907 one savior to wrap his wealthy arms around us and hug. Thank you for your very interesting essays, which have helped me survive these awful times with some degree of my sanity intact!